﻿ Magazine content за Август 2012 г. The author proposes a justification of the recent legal position adopted by the Supreme Commercial Court, according to which a bona fide holder of pledge shall be granted the same protection as a bona fide holder of title. R.M. Khodykin Arbitration Assessors: Sign of maturity of Society or Foreign Element in Russian Arbitration Proceedings? Currently, the institution of arbitration assessors is ineffective, and, hence, is not popular. The author being guided by the so-called model of impartial specialists proposes significant changes to legal regulation of this institution. September 24, 2012 is the effective date of the revised edition of the Russian Code of Arbitration Procedure regarding simplified proceedings. The authors analyze these amendments and share their opinion as to what difficulties during application of the amendments. The author studies and proposes solutions to certain problems connected with an expert examination during arbitration proceedings. Special attention is paid to the relations arising in connection with payment of consideration to the expert that has produced a poor expert opinion. The excessive number of complaints filed to ECHR has necessitated improving the trial procedure applied by the court: such reform should reduce the work load on judges and enhance performance of the Court. The authors review the changes that have already been completed, as well as those planned. 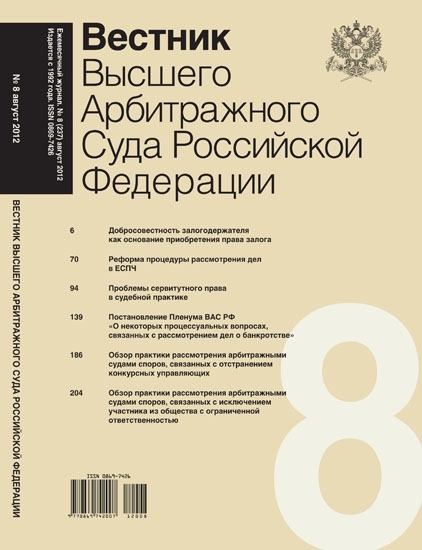 In the resolution commented on in this article the Presidium of the Supreme Commercial Court of Russia stated its legal position, whereby violation by the defendant of the plaintiff’s rights shall not be included in the fact in issue within any dispute related to the establishment of easement, and any action regarding the establishment of easement shall not be prevented from being satisfied by any right of the plaintiff to use an official plot of land under any obligation. In addition, the Presidium of the Supreme Commercial Court of Russia set forth the criteria to determine the amount of payment for easement. This overview describes legal positions contained in resolutions of the Supreme Commercial Court of Russia posted to its website at ww.arbitr.ru in June 2012. The overview was prepared by professionals from the private law department of the Supreme Commercial Court of Russia for reference only. To determine the contents of such position please study the text of relevant resolutions by the Presidium of the Supreme Commercial Court of Russia.